We love Greek salad in our family. Be it pasta salad or just vegetables, we all love the combined flavour of garlic, olives, feta cheese and olive oil. 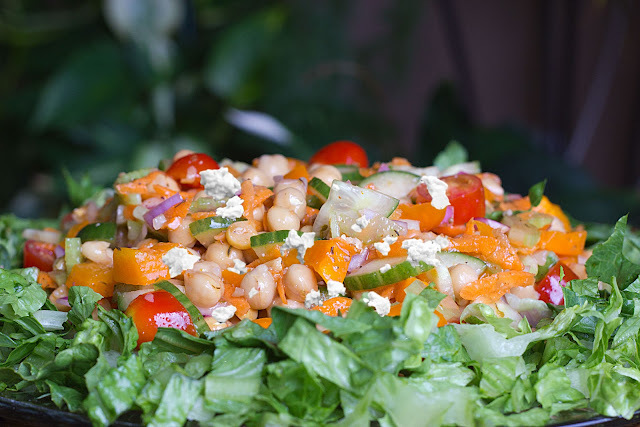 Lately I came through a recipe by Rose Reisman using beans with fresh vegetables and feta cheese. So I tried a new take on an old favourite. I used chick peas, but you can use any beans you like or a combination of beans. Loaded with vitamins, minerals and fibre beans are a healthy substitute to meat products. Omit cheese and it is suitable for a vegan diet. To cook beans from scratch, soak the dry chickpeas overnight and pressure cook for 15-20 minutes. Cut all vegetables to bite size pieces. Combine the beans and vegetables in a serving bowl. Mix all ingredients for the dressing except olive oil in a small bowl. Whisk in the oil to combine. Pour the dressing over the salad and gently stir to mix well. Chill. Just before serving add the feta cheese. Can be prepared up to a day in advance. Add lettuce, cheese and fresh herbs just before serving. 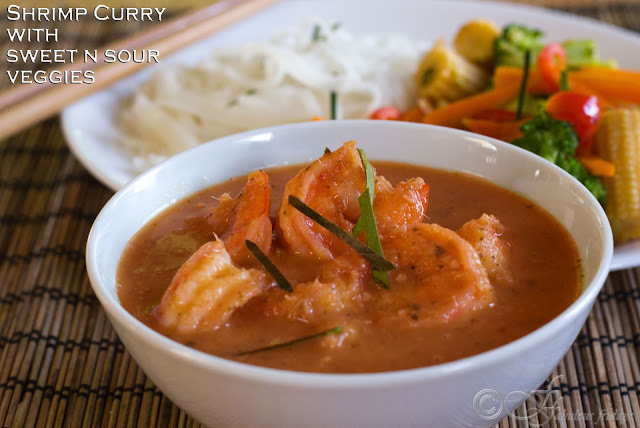 This easy to make coconut milk red curry shrimp is the taste and flavor combination that defines Thai cooking. 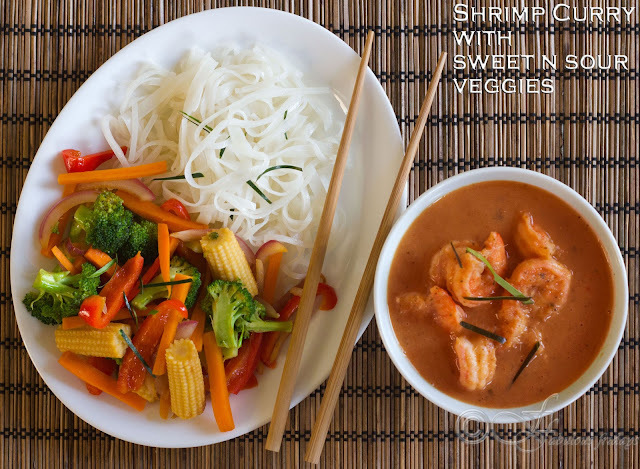 Paired with the hot and sour vegetable salad and steamed rice noodles, every last mouthful of this elegant combination is pleasure itself. The salad needs to be made just before serving and keep in mind 'quick flash cooking' so that every vegetable is tender crisp and not limp. 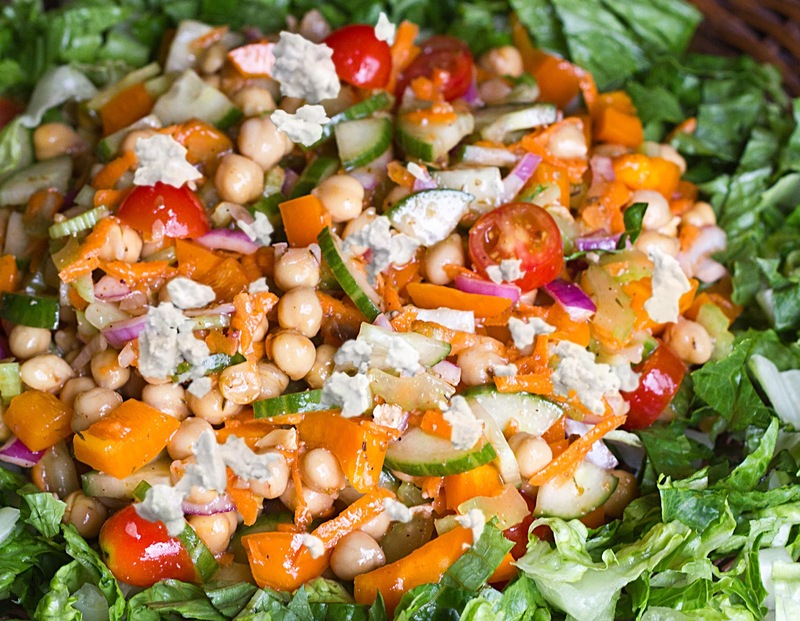 Nothing tastes worse that soggy veges in this salad. Red curry paste is quite easy to make but requires some basic ingredients. You can make your own (recipe follows) or buy the ready to use paste from the supermarket. Make red curry paste - Soak red chilies in boiling water for 10 minutes until soft. Drain and set aside. In a skillet dry roast cumin and coriander seeds till they start to pop 2-3 minutes. Grind these in a dry grinder. In a blender take this spice powder along with all the ingredients and process for 2-3 minutes till a smooth paste is formed. Store in an airtight glass jar in the fridge for up to a week. In a pan bring 1 cup of coconut milk to boil. Add 2 tbsp red curry paste and mix to dissolve. Cook for 1 minute. Now add sugar, fish sauce, and the second cup of coconut milk and bring to boil. 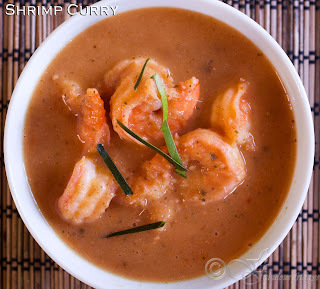 Add shrimp and cook for 2-3 minutes till shrimps turn pink and springy. take off of the heat. Taste for the perfect blend of sweet and salty. Adjust by adding more of the sugar or fish sauce. Serve accompanied by steamed rice or rice noodles. Heat a wok over high heat and add the vegetable oil. Add onion and ginger and sauté for about 1-2 minutes. Add all the vegetables and stir fry on high for 2-3 minutes till they are tender crisp. Remove from heat. 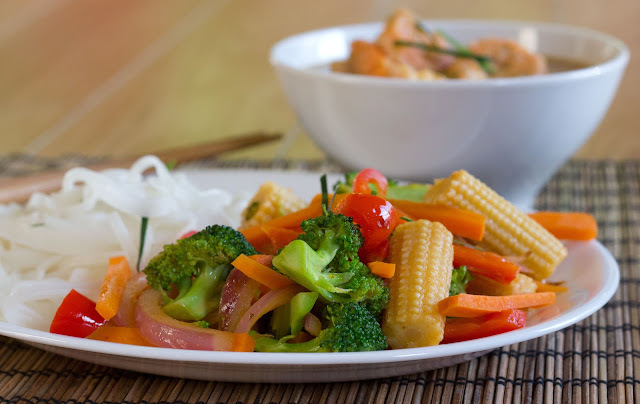 Mix all dressing ingredients together and drizzle over the vegetables. Serve warm. 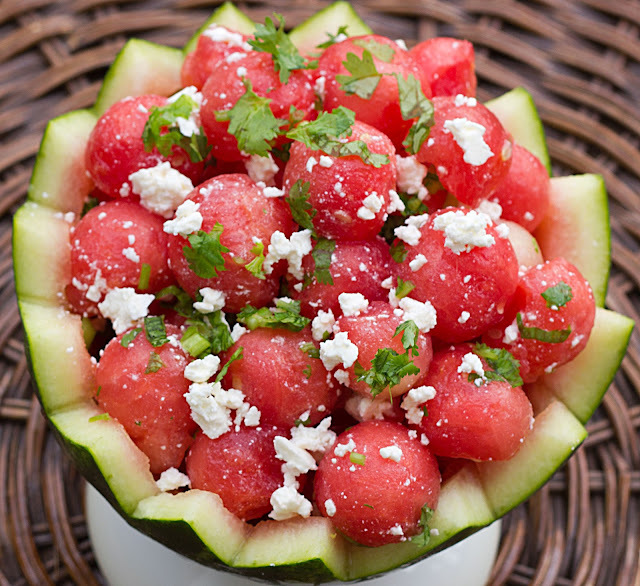 No other fruit says summer like the luscious, thirst quenching watermelon. Although watermelons can now be found in the markets throughout the year, the season for watermelon is in the summer when they are sweet and of the best quality. Making them a part of the meal adds colour and vibrance. This anti-oxidant rich fruit is a great thirst quencher and has powerful anti-inflammatory properties. 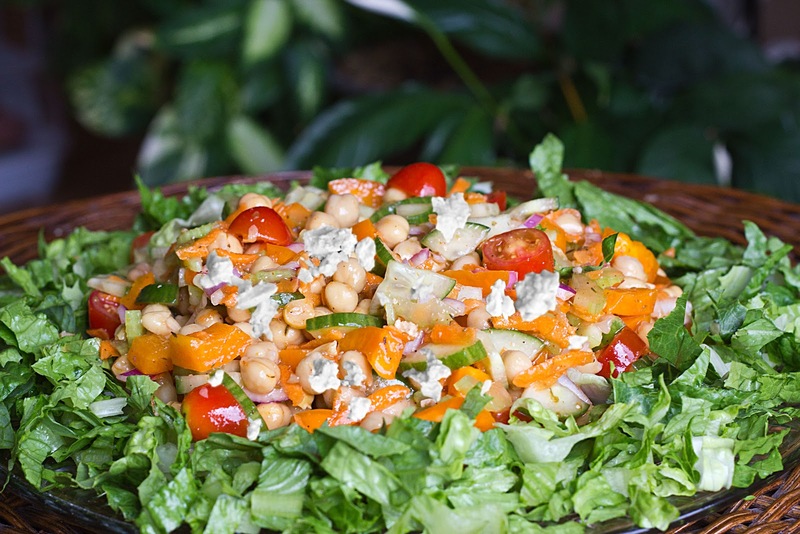 This salad pairs perfectly with any grilled fare and delights kids and adults alike. 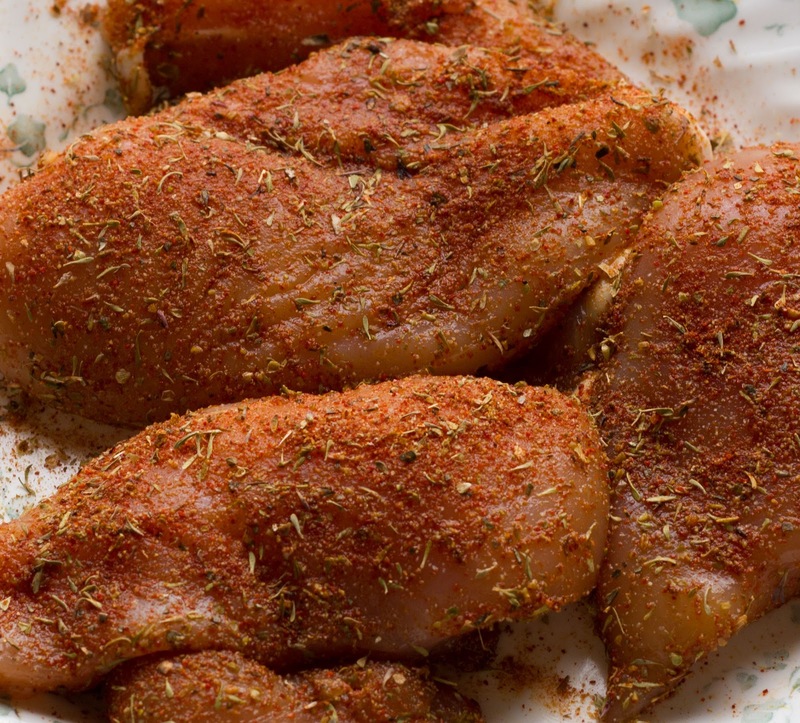 Cajun spice mix is one recipe which most cooks need in their repertoire. It is a better tasting version of what you find pre-mixed in the markets. The best part is all these ingredients are already in your pantry all you need to do is mix them in a specific ratio. A good base for the Cajun spice mix starts with equal parts of ground cumin and coriander. Paprika lends some sweetness and colour. Cayenne pepper will give the heat and this is the spice you can play with to achieve the desired heat level. I never adds salt to this spice mix since it is a personal preference for everyone. Just add your own to the mix or season the meat before rubbing the spice mix. You can use this spice rub for chicken, fish, even pastas and rice. Read more about this spice mix here. Heat the grill to high. Mix together all the spices for the spice mix in a bowl. Coat them generously with the spice mixture. 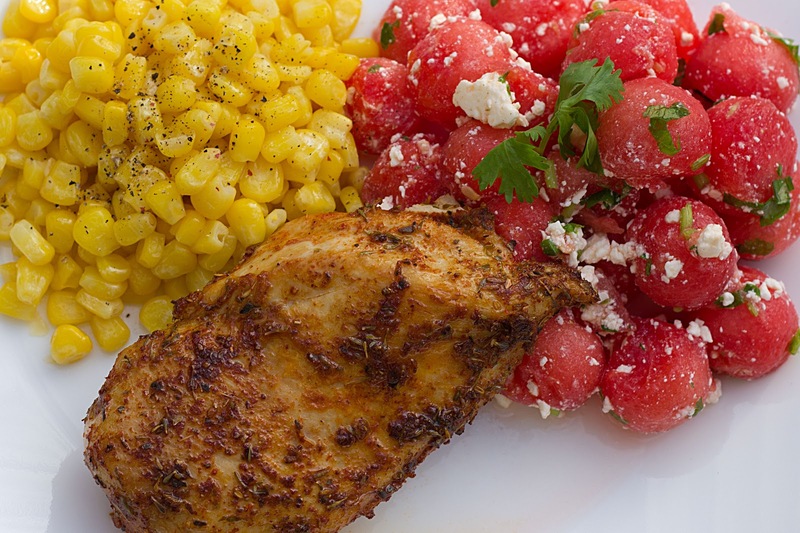 Cook on a gas grill-- Spray with some vegetable oil and place the chicken on the grill, and grill until lightly golden brown and a crust has formed, about 3 minutes. Turn the chicken over, close the lid and continue cooking until just cooked through, about 6 minutes longer. Cook in the oven-- In an oven proof pan take some vegetable oil and heat it to high. Brown the chicken on both sides for a minute each and then transfer the pan into the oven. Cook for 10-15 minutes till chicken is no longer pink from the inside and the internal temperature reaches 175 F.
Let rest for 5-7 minutes. Use a melon baller to shape equal sized rounds of watermelon. If you don't have one, cut one inch cubes. 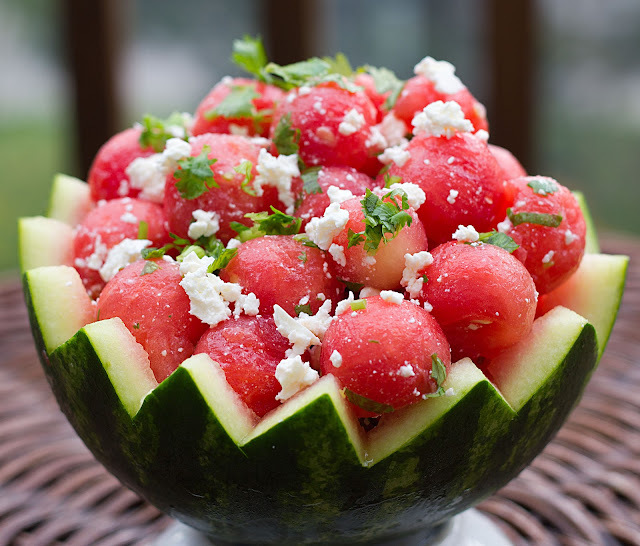 In a medium bowl take watermelon balls, lime juice, parsley, mint, black pepper and olive oil. Toss gently to combine. Sprinkle with some of the feta mixture. Serve immediately. Cajun cooking is a combination of French and Southern cuisines, and is a robust, country-style cooking (can be called a rustic cuisine). Composed of many different spices, Cajun seasoning is a complex blend of spicy, earthy, pungent, and grassy. 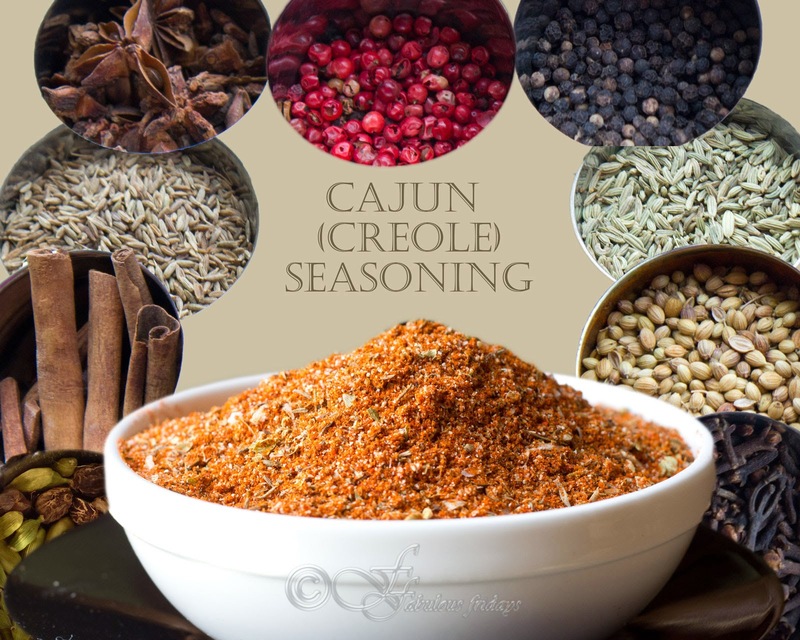 Cajun seasoning is used heavily in gumbo, jambalaya and blackened fish dishes, as well as for spicing up boiled shrimp and crawfish, French fries and sauces. You will find most of these in your pantry. I strongly recommend making this during the BBQ season. You can use it as a spice rub for chicken and fish. Quinoa pronounced as 'keen-wah' is one of the most nutritious seed (pseudo-cereal) in town. 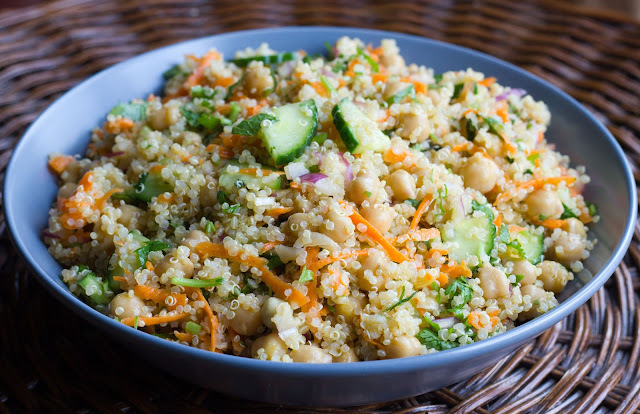 The protein profile of quinoa is impressive because it is a complete protein, which means it contains all the nine essential amino acids. This fact is specially important for vegetarians and vegans since most other complete protein foods are meat or dairy-based, not grains. Being a whole-grain seed, it is also naturally a good source of iron, magnesium, vitamin E and potassium. 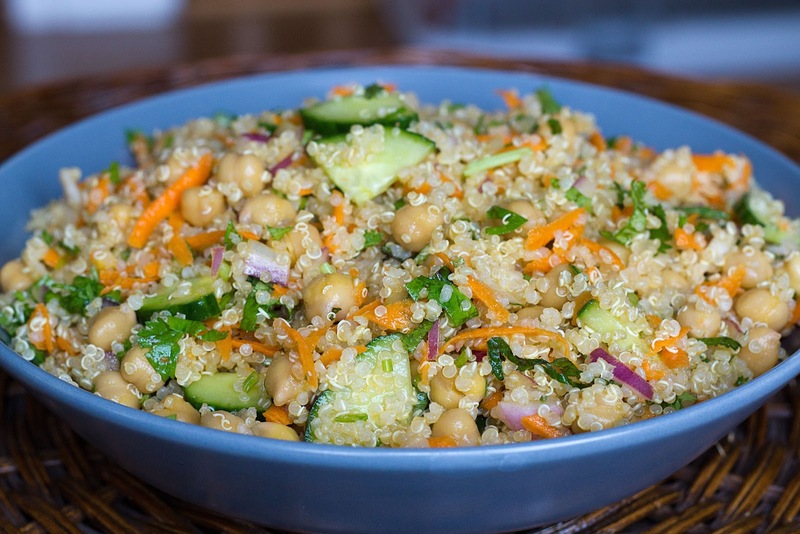 You can find quinoa at any grocery stores or speciality food stores. 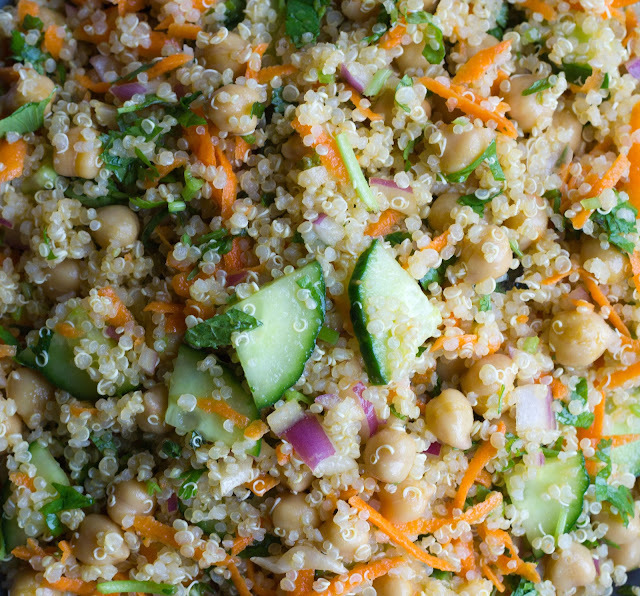 Quinoa can be substituted for any rice recipe but it works specially well in salads. Mix it with almost anything and you have yourselves a delicious, nutritious meal. This recipe here has a great blend of flavours with mint and lime juice. The sweet and tart cranberries add the perfect punch and colour. Wash quinoa for 2 minutes in a strainer. this is necessary to remove a soapy residue on the seeds. Add to quinoa 2 cups of water with cumin, coriander and salt and bring to boil. Simmer and cook covered for 12- 15 minutes till the seeds absorb all the liquid. Fluff with a fork. Keep aside to cool. Combine cooked quinoa, beans and vegetables in a serving bowl. Flavour with lemon juice and olive oil. Cover for 15 minutes before serving to allow the flavours to blend together. 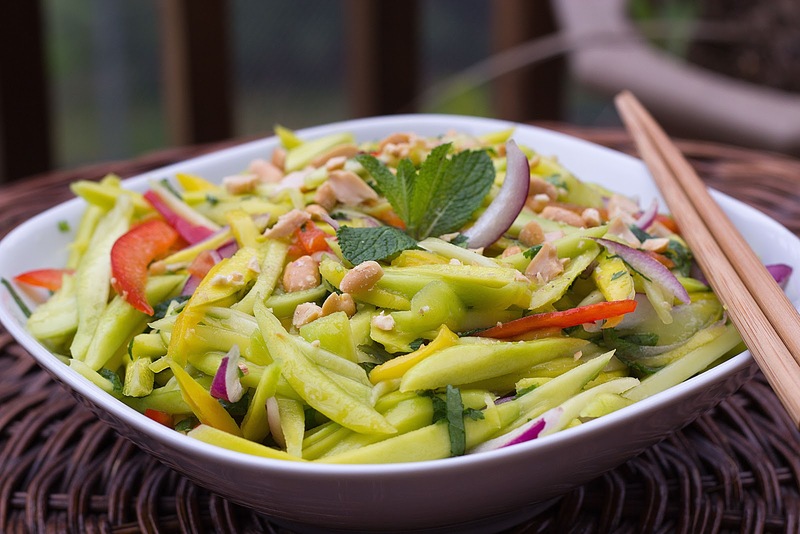 This is a very simply dressed salad which is refreshing and balances the heat when served alongside any hot Thai dish. The tart green mangoes are the main ingredient. The crunch comes from red onions and roasted peanuts white a handful of red peppers incorporate color. Green mangoes are easily available in Asian markets. The main skill here is to shred them correctly without hurting your fingers. 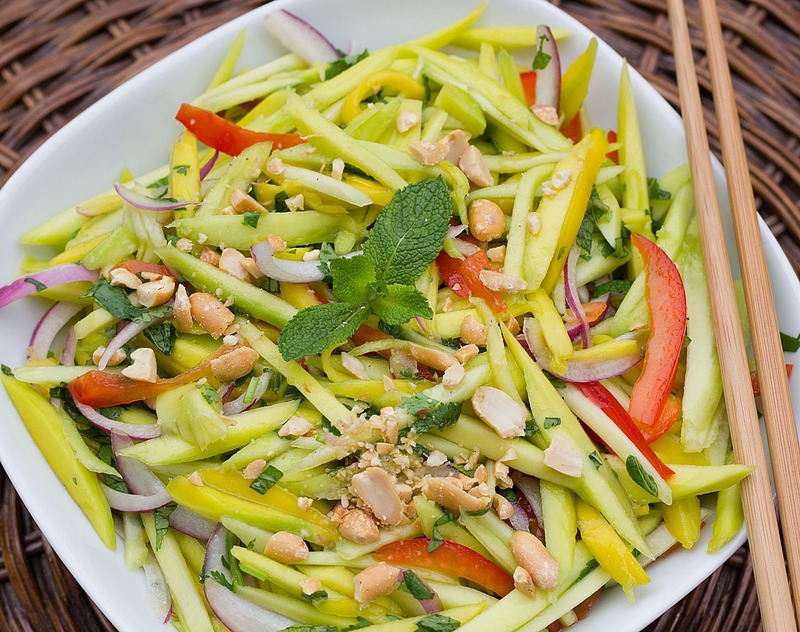 Fresh, sweet and sour mango salad goes very well with any grilled seafood and is a must make as summer approaches. Peel the mangoes with a peeler. Taking one mango at a time in your palm, carefully score deep gashes across the entire surface with a sharp knife. Now slice a thin layer off the top and continue till you reach the pit. You will see thin shreds falling in your salad bowl. 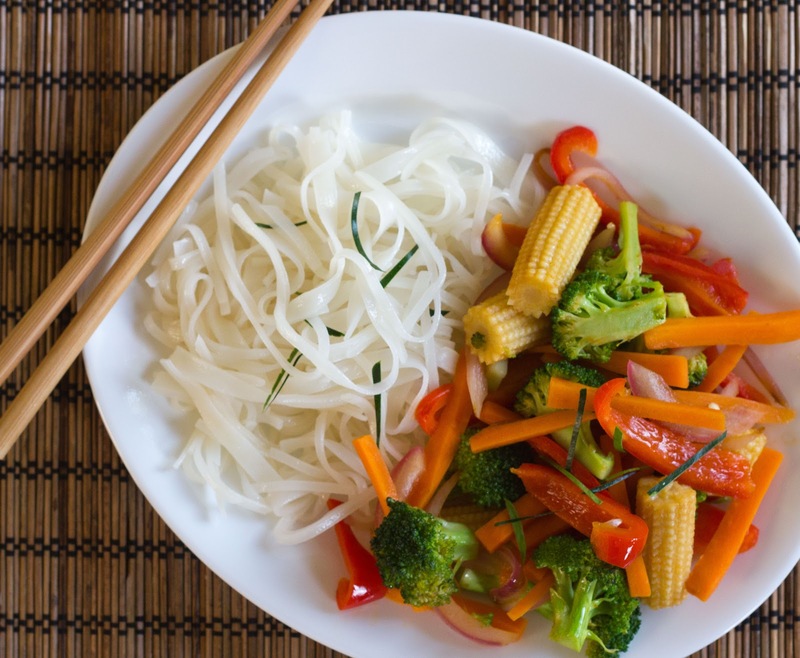 Cut red pepper into thin strips and thinly slice the green onion. Now mix everything together in a large bowl except the peanuts. Transfer to a serving bowl. 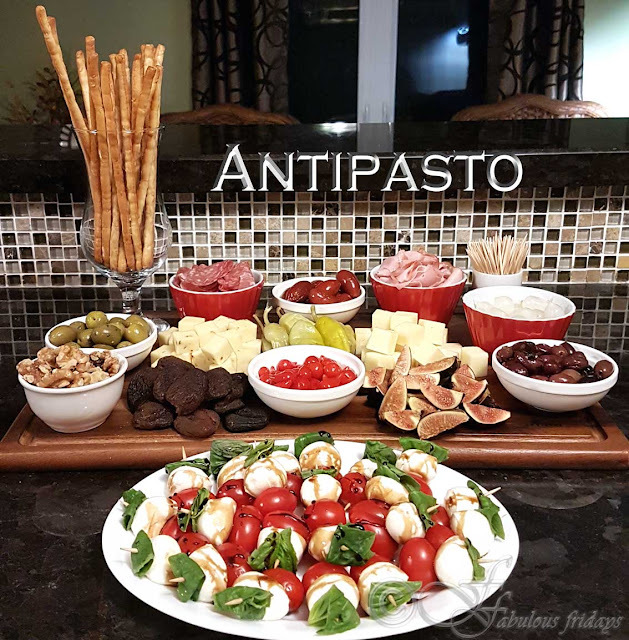 Can be kept at room temperature for about an hour before serving or refrigerate for up to 5 hours. 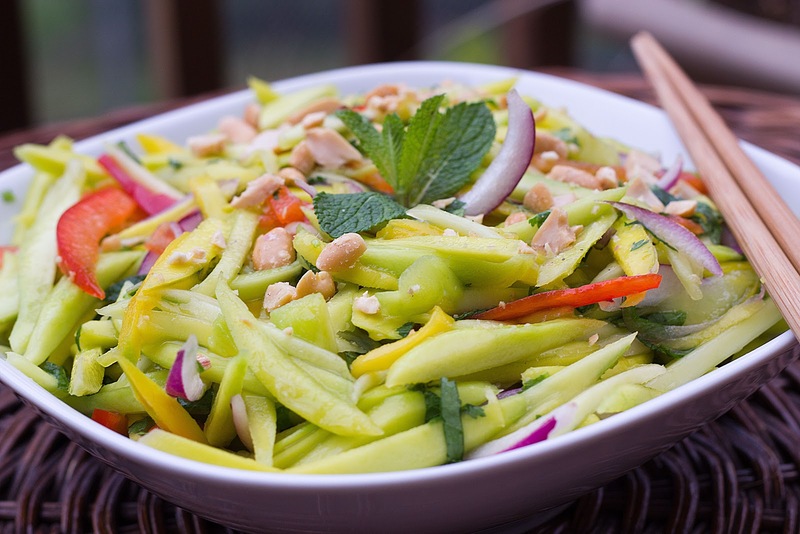 Just before serving give the salad a final toss with coarsely chopped peanuts.